The Nemean Lion, in Greek mythology, was an enormous, terrible beast who came down to Earth from the Moon in a meteor and ravaged the animals and people of the hillsides around Nemea. One variation of the story is that Hercules is the offspring of Zeus (who else?) and Selene, Goddess of the Moon. Hercules was the strongest man on earth. When he unwittingly killed his own family, the Oracle on Delphi told him he would have to serve as a slave to his cousin, King Eurystheus, for 10 years and perform ten labors (later to become twelve). The first of the Twelve Labors assigned to Hercules by Eurystheus, with the help of the ever-jealous Hera, wife of Zeus, was to kill this invincible lion and bring its skin back to Eurystheus. Hercules set out for Nemea. On his way, he came to the town of Cleonae. There, he spent some time at the house of Molorchus, a handy-man of sorts. Molorchus offered to sacrifice an animal to the gods for a successful hunt. But Hercules asked him to wait. They agreed that if Hercules returned with the lion skin by the end of 30 days, they would make the sacrifice to Zeus. But if Hercules had been killed, Molorchus should make the sacrifice to the slain hero instead. After a time, Hercules went on his way. He tracked the lion to a cave with two entrances, one of which he blocked so the lion could not get out. The skin of the lion was so tough that none of Hercules' arrows could pierce it. So, he went after it with his club instead. Inside the cave, Hercules wrestled with the great lion and strangled it with his mighty arms. He had to use one of its own great claws to remove the skin. 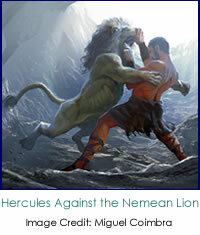 Realizing how impenetrable the skin would be, Hercules wore the skin of the Nemean Lion as armor from then on. Hercules became a hero for saving the people of Nemea....and Eurystheus became so fearful of him that he had a large bronze jar made in which to hide from Hercules, if need be. Returning to Cleonae, Hercules again found Molorchus and together they made their sacrifice to Zeus. Zeus placed the stars of the defeated lion in the sky to commemorate Hercules' bravery. The sign of Leo has long been associated with royalty, eminence, and authority. Its royal title is presumed to originate from the brilliance of Regulus and its ancient proximity to the Summer Solstice. The noble lion has been regarded as a creature of kingly attributes at least since the time of the Egyptian pharaoh, Nechepso, who is thought by some to have reigned from 678 BC to 672 BC. His priests taught that when the world was created, the Sun rose near the star Denebola in the constellation Leo, that this location was the emblem of fire and heat and was the "House of the Sun". The Sun, source of all life and the will to shine in one's existence, is identified as the ruler of Leo to this day. The energy of Leo is confident, courageous, vigorously alive, and forceful. It is generous and civil with a desire to rule. If you don't have much Leo energy yourself, you can be totally bowled over by it, finding it hard to keep up with and being totally worn out when it's over. On the other hand, if you are part Leo, you'll feel emboldened and energized at these times, completely in your realm. An overabundance of Leo energy present in our lives can lead us to acting in an overbearing, arrogant, bombastic manner with little regard for others. Our confidence becomes a swaggering pride, careless daring, and even cruelty. Our generosity becomes a need for self-aggrandizement and showy dress. Leo is the Latin word forLion. The constellation of Leo is one that is easily imagined as a lion. Leo contains many bright galaxies and stars as well as an asterism. An asterism is a portion of a constellation that could be considered a constellation itself. Leo's asterism, the Sickle, represents the head and mane of the lion. the bottom of the Sickle is the blue-white star Regulus, meaning Little King. Regulus is the brightest star in the constellation and is often called Cor Leonis, the lion's heart. 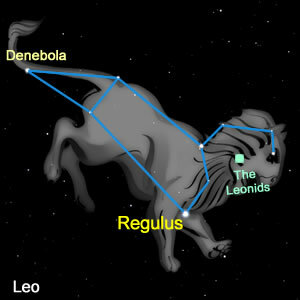 Another blue-white star, Denebola, represents the tip of the lion's tail. Up until about 240 BC, Leo had a much more magnificent tail. But around that time, the astronomer-priests under Ptomely III split part of it off to become the constellation Coma Berenices, named for the hair of Ptolemy's daughter, Bernice. There are also a large number of meteor showers associated with this constellation. The most famous is the Leonids, which can produce spectacular displays that appear to radiate out from the constellation. They are very fast and usually contain many bright meteors and trains. About every 33 years, the Leonids experience a period of heightened activity when its parent comet, Temple-Tuttle, returns. Hundreds and even thousands of meteors per hour can often be seen at that time. The last event occurred in 1998-1999. Leo can be located by following the stars on the outer edge of the cup of the Big Dipper south to the bright star Regulus. Look for the group of stars forming a backwards question mark. It is best seen in the Northern hemisphere during the spring months and during the autumn months in the Southern hemisphere.